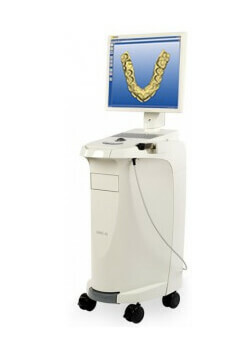 CEREC single-visit dental crowns bring convenience to your restorative dental care at Ritchie Dental Group. For patients with significant decay or tooth damage, you no longer have to put off a trip to the dentist out of fear you’ll have to schedule multiple appointments. Using CEREC single-visit dental crowns technology, we can design, create, and place a custom-milled, natural-looking dental crown, onlay, or inlay in a single visit. You don’t have to worry about a temporary or the inconvenience of a follow-up visit any longer! CEREC single-visit dental crowns make life easier for the patients of Ritchie Dental Group in Marble Falls, Texas, Burnet, and Brady. We respect your time, and that’s why Ritchie Dental Group has invested in revolutionary CEREC single-visit dental crowns technology. In just one appointment, our dentists can create durable, natural-looking, all-porcelain crowns. Often a tooth crown is the only treatment that can salvage a severely damaged or decayed tooth, and we want you to rest assured we’ll take care of it quickly. When you come in, we’ll first take a 3D image of your tooth, and then in the same appointment, mill your ceramic crown using our innovative CEREC single-visit dental crowns machine while you wait. Finally, Dr. Ritchie will permanently place your brand new, custom-milled porcelain tooth crown and you’ll go home with a complete, healthy smile and no need for a second visit. CEREC single-visit dental crowns can be used to repair all types of problems: broken teeth, fractured teeth, chipped teeth, and teeth that have been treated with root canal therapy. If you have a tooth that has been damaged by extensive decay, we may use a CEREC single-visit tooth crown to repair the damage instead of a filling. Because they’re made from attractive porcelain and completed in just one visit, CEREC single-visit dental crowns have something going for them that more traditional tooth crowns do not: convenience. Ritchie Dental Group uses technology like CEREC single-visit crowns technology because we believe in the power of modern dental treatment. There’s no need to travel to Austin for the big city dental care you desire – we have the technology you need right here at our Marble Falls and Brady dental offices.